We have to pinch ourselves that we’ve been at sea over a week. The big bite is that on the map we’re still just south of Texas when it seems to us we’re in outer space. Winds are very light and likely to remain so for many, many miles so our hoped for arrival in mid April may have been a bit optimistic. We’re moving along steadily but much slower than our anticipated average speed of 5 kts. That’s ok, though. The weather is fine with only the occasional light squally patch that makes us reduce sail only to find ourselves under-canvassed during the night watches and reluctant to wake the offwatch to do anything about it. There are worse things in life, but it’s cold turkey for those of us addicted to news of the world on demand. Our little portable shortwave radio seems to have packed it in so there’s no BBC or anything else to keep us informed about the world. We mostly read, listen to music and talk about what to make for dinner. 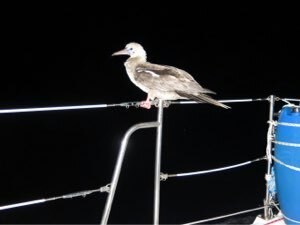 Last night a large seabird moved in on the port gate and it took both Jack and me many tries to convince him to move along, even aided by a boat hook. He squawked and complained and kept flying back but as cute as he was, his hind quarters were suspended just above the cleat where we secure the jib preventer. Yuck, no thanks, buddy. I tried the bread in the Ziploc bag recipe yesterday but I maybe didn’t mix it well and ended up with an unmanageable lumpy sticky mess that I couldn’t handle easily for the planned English muffins. We made pizza instead, and had a late dinner after the usual sail change before dark. Lovely fresh mango for breakfast from our dwindling supply of fruit.